cathedral window quilt, originally uploaded by hyena-in-petticoats. Not that I need a new sewing project to start… but this is amazingly cool looking and the tutorial makes it not too hard looking. I have never seen a Cathedral Window Quilt before, but really love the rounded shapes. I also like the quilt as you go, no backing needed, idea. I discovered this tutorial, after following a blog link from a comment here on my site. Sophia Aster commented on my ugly quilt post, where she had followed a link from my comment on the Quilting Gallery’s Ugly Quilt Contest (where I regret not entering my doggie car quilt) I just love the paths that the internet can take you on. Maybe once I am done with rearranging my studio I will take on a little pillow using this technique. It will have to be all my doggie prints for the color parts. 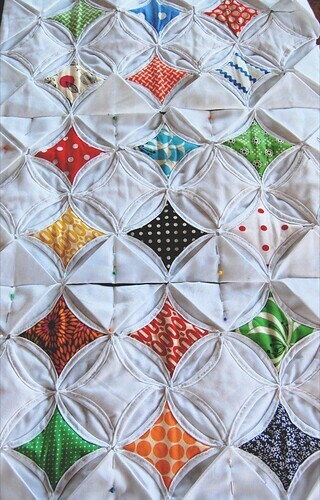 This entry was posted in Fiber Goodness and tagged quilt on July 16, 2009 by Sheba. I love her blog too!!! She has amazing clothes!! And I want her hair !! !